It is handwritten because I needed to get it out quick. This was inspired by getting one of those cheapie battery operated fans that have plastic floppy blades. It cost a buck, had a nice little dc motor, a 2 AA battery pack with a switch, and a removable hub that holds the fan blade on. As I drove home, I couldn't believe what a great deal it was for the dollarfan. When I got back, I made a quick little video of the "what could you do if you had a lot of these little fans?" idea. I probably get a couple dozen at least of the fans. There are probably more than two or three in the house already. If prople could weigh in on project ideas, then others could try the project idea out with whatever stuff they have handy. They could then post it up and the open source project could be widened with reader commentary and documentation. The larger idea: is to create a kit based on very cheap objects like the fan. Things that have incredibly good cost to features value, like the dollarfan. Things like the old cd drives I used for a workshop at the Duxbury Student Union a few weeks ago, and other electromechanical junk. Inside the kit could be supplies like coroplast, magnet wire, machine screws and nuts, some hardware, some tools, all very cheap, replaceable, upgradeable. Enough to get some things done, cheap enough to provide variety. 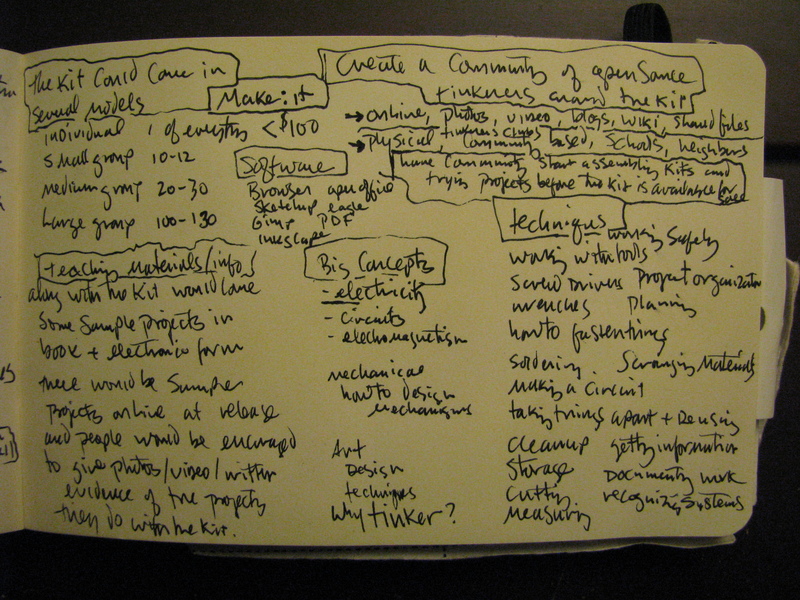 This would give people a way to experiment with the Design Process in a collaborative and low stakes manner. Included in the information side of the kit would be some project ideas, questions that could be answered with inventions, thought triggers on paper, and in digital form. All of the projects would be listed first on the web in a forums like place. People would show their products in flickr, youtube, and what ever other systems they wanted to use. If they used a consistent tag, then the products would be easier to find. Makekit would be a decent tag to use. This could even turn into a formal curriculum if that were an interesting idea to the right people. If somebody could create a simple project that would work on say turning a cd drive into a small remote control car, or creating a mp3 speaker out of a water bottle or yogurt cup and some headphones, then that kind of thing would be enough to get the ball rolling. Probably a dozen or so sample projects would relieve some of the 'gettting started' anxiety. Then, as supplies run low in the kit from project use, people should be recognizing the junk around them and the potential it holds. Of course, some of the text based material would include possible resources for finding replenishment supplies. The kit is a starter, and it grows as the user gains experience. To keep the thing rolling, people, organizations and schools could use a subscription model. Once a month, or at some other interval, a new package would arrive with a few suggestions of project ideas. Maybe a tool could be in the package, like a little screwdriver with phillips and straight tip or needle nose pliers with wire cutters. That would be the JunkOfTheMonth club model, as Perry Kaye put it. This idea will run out in as open a fashion as possible. Ideally, it should get lots of feedback and inspire some people to be collaborators. There are a few to turn to at this time, but through the forums and comments, certainly more would come out. It would also be possible to have people add ideas from developing countries. So anyway, what do you think? What should be the first device to deconstruct/morph/hack/mashup? CD drive, dollarfan, cassette player? If you want in, send me a message, or add info into the comments. 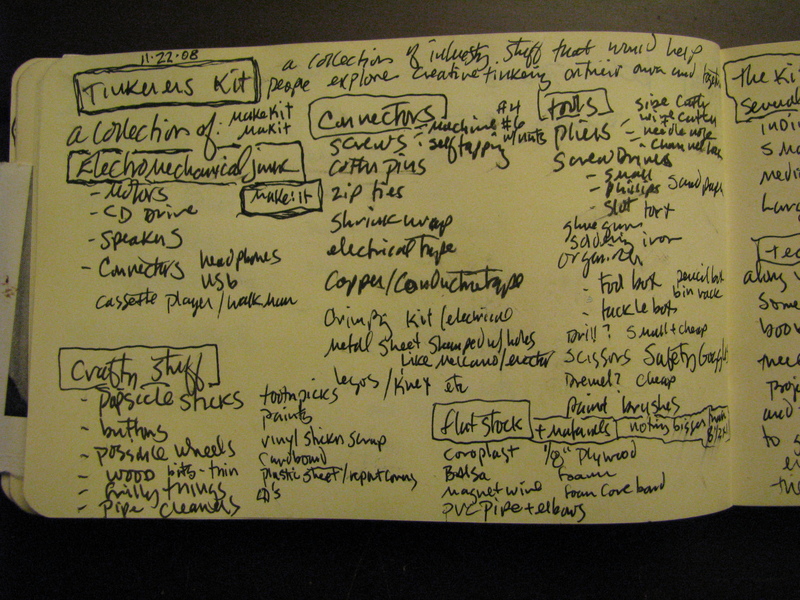 Tag your product with kitjunk or Makeit to help us keep track of what each other are doing.